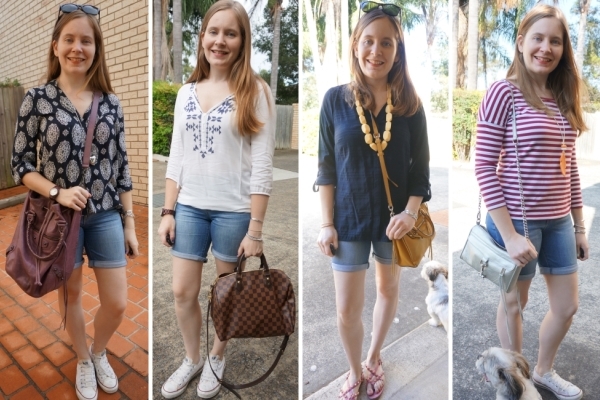 It's a little odd sharing ways to wear denim shorts in autumn, but in Brisbane the weather usually takes a while to realise it's autumn and start cooling down, so even in March these shorts were still on frequent rotation! My goal for this past summer was to reach 30 wears with at least one pair of shorts. After buying a lot of new pairs at the start of summer, it proved harder than I thought, as I wanted to wear all my new ones. I mention this every now and then, but 30 wears doesn't sound like a lot until you actually try do it it. You need to wear something every other week for 14 months to hit 30 wears for example. I've had these shorts for 16 months so I'm feeling pleased I managed to reach 30 wears with them. I bought these bermuda denim shorts in the Jeanswest sale back in November 2016. They have been a summer staple for me since! They were a part cash part gift card purchase. If you don't include gift cards in cost per wear, they were $6.98 so that's 23 cents a wear! If you want to count the gift card, they were $27.99 in the sale so that's 93 cents a wear. Both under the $1 per wear that most people seem to aim for. I'm pleased I got these. They are the 'Trinity' bermuda denim shorts. When I stopped wearing my blue jeans (haven't worn a pair since June 2017!) I did wonder if I should stop wearing these for a bit too. They are just a shorter version of blue jeans after all! I have so many summer clothes though that I didn't feel these denim shorts were worn so often that I was in a rut with them. It's been interesting staying away from my blue jeans for a while, but I have lots of other colourful denim options so I'm not missing them too much yet. I'll be interested to see how long it is before I reach for them again! A simple and classic summer outfit, a pair of denim shorts and a tee. I think this is a universal summer outfit for most of the world, and definitely a go-to for me. You can also see my love for studded sandals in this set of photos, ha! To change things up a little, sometimes I'll add an extra layer and throw a kimono on top. See more: 30 ways to wear studded gladiator sandals. 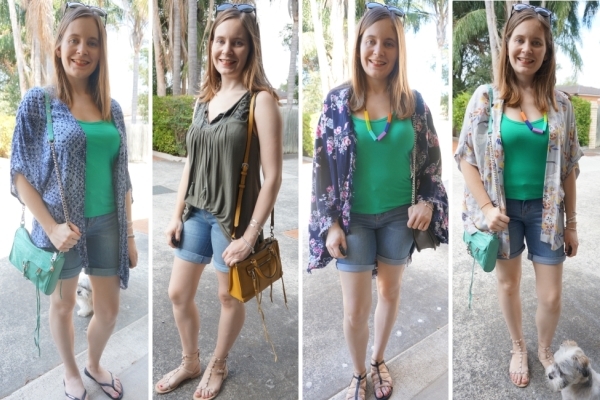 As mentioned above, I love my kimonos, and denim shorts and kimonos are an easy summer option! 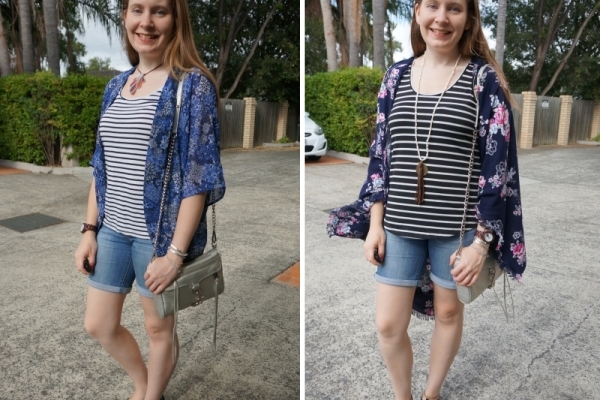 I love the simplicity of a colourful tee or tank and shorts with a fun printed kimono, it adds an extra layer to your outfit, a little more interest, and is a good way to change things up slightly. 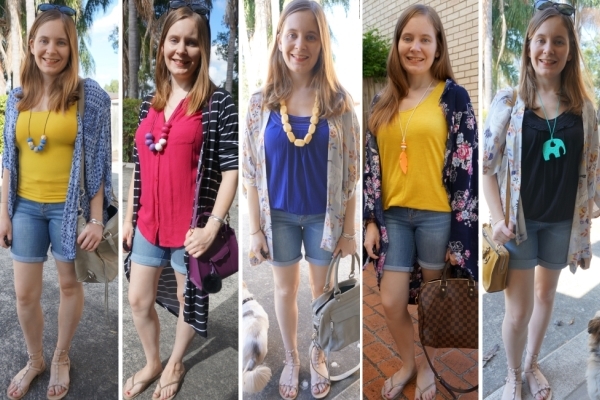 All of these 5 kimono outfits look different, but follow exactly the same formula. See more: 30 ways to wear a floral kimono. With plain blue denim shorts, it's a good opportunity to wear some printed pieces. I have a lot of printed tanks and it's good to wear them with these shorts as you don't have to worry about matching, they are a blank base to whatever you wear. Just like the set of outfit ideas above, this is another way to wear printed tanks. The denim shorts mean you can be more adventurous on top, and they are a good base to try some print mixing with. These photos combine the printed tanks and kimonos ways to wear together in one outfit, and were a lot of fun to wear. I like to layer a little in summer, but every now and then I want something different from kimonos. This is where this dusty pink vest comes in. It's a nice light summer layering option as it adds a splash of colour to an outfit without adding any extra warmth, perfect for making a plain tanks and shorts outfit a little more interesting. 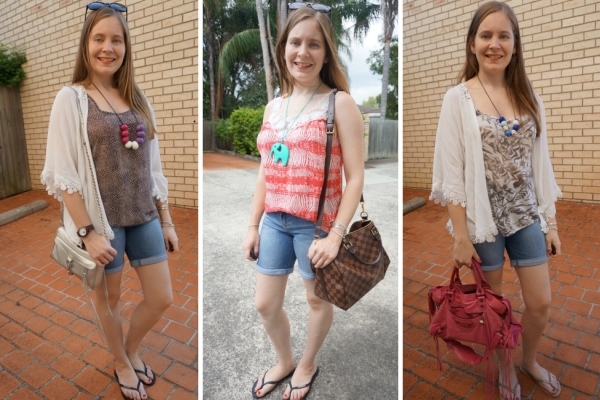 It's easy to see what my most-worn top is with these denim shorts! 3 out of the 4 outfit ideas above are the same tank, just with different kimonos! I've really embraced wearing green and blue together, and so wearing a green tank with these blue denim shorts has been a frequent outfit. Khaki green looks just as good as this bright emerald green. With blue shorts, a blue top is a no-brainer for a quick monochrome outfit. Just like the green tops above, again you can see some repeats here. The navy wrap top has been worn twice with the shorts, just swapping out the accessories to make it look a little different. If something works and you love it, I'm a big fan of repeating the combination again! As someone who loves blue, monochromatic outfits with navy tops and blue shorts make me happy. Of course shorts aren't just for summer. You can easily wear them in spring and autumn too. 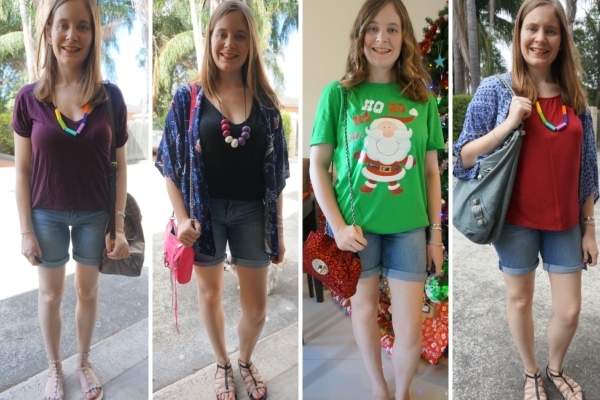 In Brisbane it's not that cold for most of the year, so it's easy to wear shorts frequently! A simple way to wear shorts for slightly cooler weather is to add a long sleeved top (even though the first long sleeve outfit pictured is with a dress). If a long sleeve top on it's own isn't enough even with the longer length of the bermuda shorts, you could add some closed in shoes too to make yourself a little warmer. Converse are my usual go-to! While I'm not a shorts in winter person, I do try and wear my shorts as much as I can through the year - the mild Brisbane weather makes that achievable! This month I did a little something different and modeled a few of the outfits so you can see what they look like on. Want More Ways to Wear? Browse the archives to see all of the 30 + ways I've worn these shorts. While denim shorts are a wardrobe staple and you're likely to have a pair you love already, I hope this post gave you some different outfit ideas or inspiration and some different ways to wear your shorts. Linking up with Trend Spin, Turning Heads, On Trend, Confident Twosday, Style File, Fashion Frenzy, Style On The Daily, Fashion Files, Fun Fashion. haha yes! It's harder than you think at first. Lounge wear is the best too, mine is usually just old clothes that are too worn to wear outside, but it's comfy so that's all that matters! Denim shorts and kimono is my favourite combo. I bought quite an amount of kimonos 2 summers ago and I love them so much, they are the perfect pairing to shorts!! Hope you had a beautiful Easter, we will celebrate ours next week! I do love shorts and kimonos in summer! I love working out price per wear on items I've worn loads! These look like such a staple pair of shorts - I'm not a massive shorts wearer either but I have quite a similar pair that I wear every summer! It always amuses me how you're able to keep track of how many times you wore it, such a clever idea however you did it. My favourite matching is with the printed tanks especially with the off-white frill cardigan. Hope you're enjoying your long weekend. It was super busy nevertheless fun Easter Sunday and now getting ready for work tomorrow. Wearing shorts even in summer isn't always possible here, it would take me forever to actually get 30 wears on the one pair that I own, and most of the wears would be when I am away on holiday. haha yes! You'd probably get more wear from winter coats with your climate! Denim shorts are definitely a pair that will go with everything, so probably such a great purchase!! You show so much variety, Mica---how impressive! Thanks Jodie! It's always fun looking back to see the different ways I've worn things. Thank you Emmy! I'm enjoying trying new things, I never used to edit my videos before! It's interesting seeing just how few pieces I have achieved 30 wears with, something I want to improve! I don't have any bermuda length shorts, but you are making me think I might need a pair. They are a great length for moms. So many of the shorts out right now are just too short for me. I always love your kimonos. Being tall doesn't help, haha! These are just the perfect length for me worn cuffed, I love them! Go Mica! Denim shorts are so versatile and I especially like them with kimonos. I didn't realize the benchmark was $1/wear. I have definitely hit that with some pieces, but have quite a few dresses that aren't near that. I'm gong to start wearing more of my closet! I don't know where I've heard that before, but so many people seem to hold it up as the standard! I have pieces I've worn less than 30 times but are under a $1 per wear, it's interesting when you see how much value you're getting from your wardrobe! I love these shorts, I need to get some like this for when I go on holiday! They would be perfect for a summer holiday! You came up with so many cute ways to wear them! I especially love them with your kimonos! I love that arithmetic you do. So we realize how much a garment actually costs. all the looks are very original, I confess that I don't like wearing shorts, my legs are so white !!! Thanks Marisa! I just embrace my pale legs, haha! It's interesting seeing how much things cost per wear! 93 cent per wear seems like a great price. I love how you broke down the price, diving the sum you've spend on this item and the amount of time you wore it. I should do the same sometime with my items, it sounds fun. Plus, these bermuda shorts are super pretty. I love all of your outfits. I love how you styled them with long sleeves. It is great that you managed to come up with so many different outfits. Perfect inspiration for wearing bermuda shorts. It is an interesting thing to look at, to see how much value you get from your wardrobe! You're right that 30 wears doesn't seem like all that much until you start actually counting! Those shorts really do go with everything though--what a great staple. I love the length too. I struggle sometimes to find shorts I like, I feel like they're either too long or too short, but this is a perfect length! Yes, these are just the perfect in-between length on my petite self! :) I think shorts are a staple for sure. You are so right, 30 wears dosen't seem like much until you actually start counting! And it's true we always have more clothes than we can feasibly wear. Just that constant craving for something new. Yes, it's scary realising how many outfits I can create with my wardrobe right now, and yet I still want new things! ha! I seriously love these posts because it really showcases your creativity when putting a look together! I love the way you sometimes dress up these casual shorts! Thanks Deborah! :) It's fun to look back and see the ways I've worn things. very creative! I haven't worn denim shorts for a while! Looking great by the way. Thanks for the share. Love the way you styled those shorts! I reach for my denim shorts all summer long! They are such a great versatile piece! I love some of the things you've worn with yours here! It's giving me so many outfit ideas! Hope you had a great Easter! Thanks Laura! Glad it's inspiring you! I had a lovely Easter, hope you did too! You've styled all of these flawlessly! I love each one of your outfits! 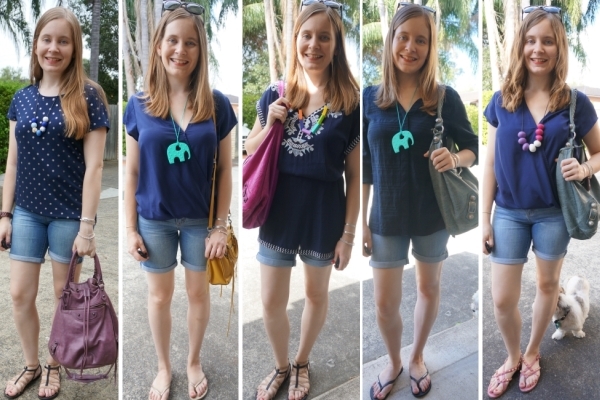 Mica, you really show how versatile denim Bermuda shorts are girl! You can pair them with so many different tops. I have Bermuda shorts, but not a denim pair. That will have to change. HaHaHa Great job! I love, love, love my bermuda shorts! Perfect mom shorts and so comfy! Bermuda shorts are so versatile. In the fall time we still wear shorts. I love the way you style yours! They get worn well into autumn here too! Mica, you're seriously making me reconsider Bermuda shorts. They look so good with it seems like everything! I'm definitely going to give them a second look! I love them with the green tank looks! So cute! I love how you were able to create 30 different outfits!! It just shows that Bermuda shorts are definitely a closet staple! My favorite outfits are the ones with the pink vest! 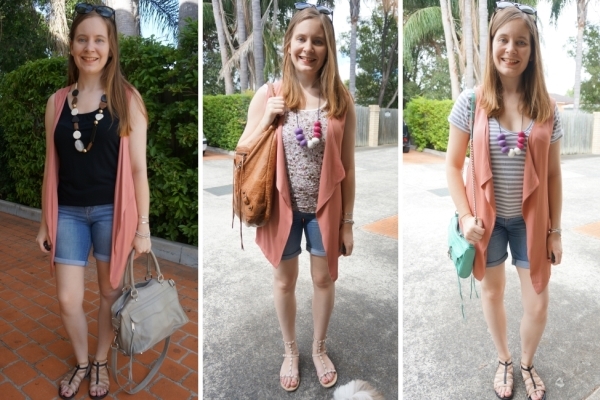 That pink vest is a cute layering piece! I need to give that vest more love, it is a fun layering piece! That shorts is very versatile. I love that you're able to mix n' match with that short. Hi Mica! Awesome job on hitting 30 wears! 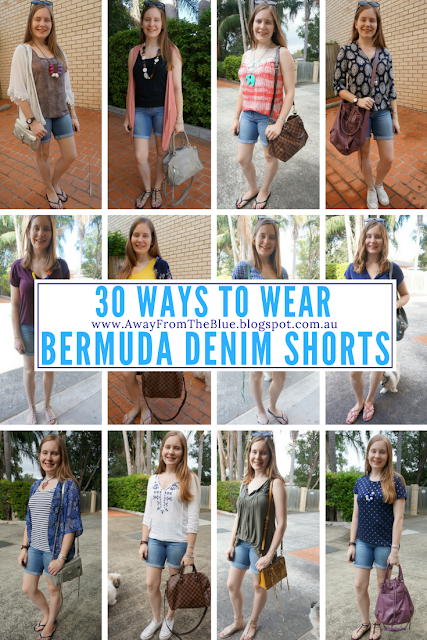 I really did not realize there are so many ways to pair Bermuda shorts! The fit is so cute and flattering on you. I love how you pair with your favorite color! Great video as well!! Thank you as always for the inspiration! Thanks Tiff! I'm glad you enjoyed the post and video. I love a good wardrobe staple like this! Have a great week. I love the 30 wear challenge because it really does make you think outside the box but not only that, it's a pretty nice feeling to know you are getting your money's worth. Great job on getting it done with your denim shorts and I do love the longer length on yours. I like the rolled up hem and the lighter wash color. It goes so well with everything just like you have shown here in your post. I hope you and your family had a wonderful weekend. I can't believe it's April but happy new month! Thanks Maureen! It is a good way to see the value I'm getting from my wardrobe! Hope you're having a nice start to your month! Denim shorts are seriously my FAVE come spring and summer! Love your Bermuda denim shorts! All well styled in 30 ways !!! I agree it is the perfect basic and can be styled in many ways. Love the tees and necklaces, and the kimono takes it to a new level! Yes! Kimonos are the best for that! So many cute looks! I have a hard time finding shorts that I like, so I usually wear skirts. I will need to do more of the 30 wears posts with my maxi skirts! Hope you're having a great week after the long Easter weekend dear! Thanks Deb! I think they are so versatile! WOW you have done an incredible job styling your very versatile denim Bermuda shorts and bringing their cost down to less than a dollar per wear. I love them so much with the kimonos and especially with that light pink long vest. I wonder who started the $1 per wear as so many people use it! Thank you all for your lovely comments and words of encouragement - it's a lot of fun putting these posts together so I'm so glad you like them too! Love this shorts, so versatile and really comfy too. You styled it beautifully dear, love the kimonos. Mica, I literally adore all of the kimonos you wear, so those are my favourite ways for you to wear the shorts. I love the peach sleeveless one too! So many cute looks here. I'm looking forward to wearing shorts this summer. Always so satisfying to get cost per wear down under $1, I'm glad I'm tracking it still!